We just got this press release form our good friends Joe Corroney and Hi-Fi color design’s Brian Mille. 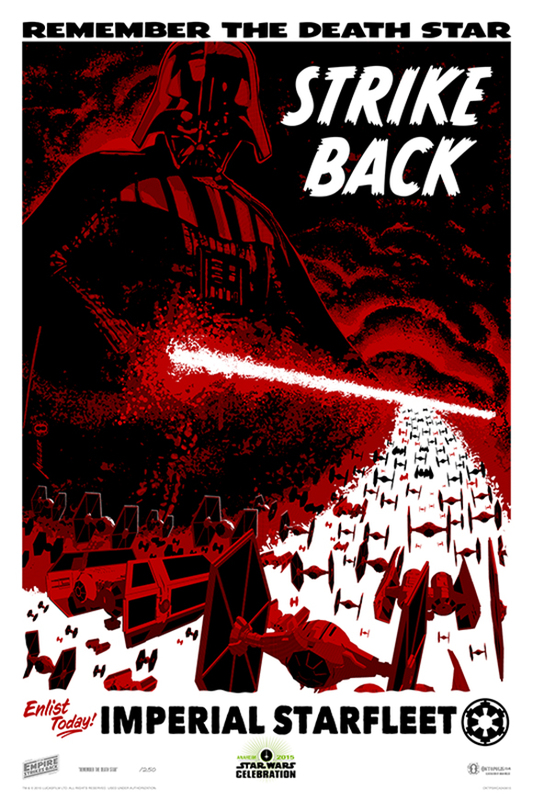 If you are going to Star Wars Celebration Anaheim check out these amazing prints that you can now pre-order and remember the force will be with you. Hundreds of artists were considered for the Star Wars Celebration Art Show, in the end Lucasfilm and the panel of judges selected 35 to create exclusive new illustrations for the event. Some of the artist chosen are known for their work in film and special effects while a handful like Alex Ross, Cat Staggs, Katie Cook, & Ken Lashley are recognizable for their work in comic books. Two such artists are the duo of Joe Corroney and Hi-Fi color design’s Brian Miller who frequently collaborate on cover illustrations for sci-fi comics like X-Files, Ghostbusters, Star Trek, and Doctor Who as well as Star Wars art for book covers, Star Wars Insider magazine, Topps trading cards, and Star Wars collectables for ACME Archives. Joe Corroney and Brian Miller each chose to represent the Dark Side of the Force and more specifically Darth Vader in their Star Wars celebration exclusive illustrations titled, “The Inquisitor’s Gift” & “Remember the Death Star”. Joe had this to say about his choice of characters, “Darth Vader is my favorite Star Wars character and hands down my favorite character to illustrate. But I hadn’t yet done a print for Celebration that just focused on him”. When asked about his artwork for Celebration Miller says, “I wanted Darth Vader to be larger than life and more of an iconic representation of the Empire. In a similar vein to how Uncle Sam was portrayed in many propaganda posters. They type and design elements were chosen to serve as a powerful recruitment tool for the Empire”. Both artists will be attending Star Wars Celebration Anaheim April 16 -19 where their artwork will be featured in the Celebration Art Show. A limited number of official Lucasfilm prints of the artwork are being made available exclusively for attendees as well. “Even though I’ve been working as a comic book and sci-fi illustrator with Joe Corroney for over a decade this will be my very first Celebration,” comments Miller, “I feel like the young Padawan to Joe Corroney’s Jedi Master and I look forward to spending time our Celebration booth meeting fans & collectors”. Joe Corroney adds, “There’s definitely a camaraderie among all of us Star Wars artists. it’s great fun to catch up with each other at these events”. As officially licensed Lucasfilm artists Joe Corroney and Brian Miller also participate in Celebration programming for the fans. Joe will be sketching Star Wars characters at Booth #1111 and Brian will be participating in the Star Wars Kids art program. Kids can learn how to draw droids with Brian during the “Drawing R2-D2 and Friends” event on Sunday. Star Wars Celebration Anaheim runs April 16-19. Fans will find Joe Corroney and Brian Miller appearing at at booth #1111 during the event. Attendees interested in the two limited edition prints, “The Inquisitor’s Gift” and “Remember the Death Star” may pre-order them March 30 – April 10 at the links below and pick-up the prints in person at Star Wars Celebration booth #1111. These exclusive prints will sell-out, pre-ordering is strongly encouraged. Information and images for the Star Wars celebration Anaheim exclusive artwork below.